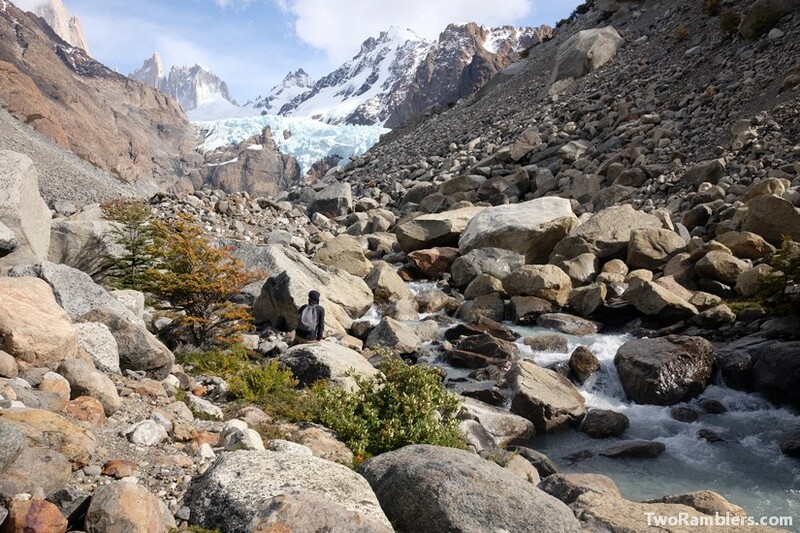 We left for this hike quite spontaneously after just arriving in the town of El Chaltén. 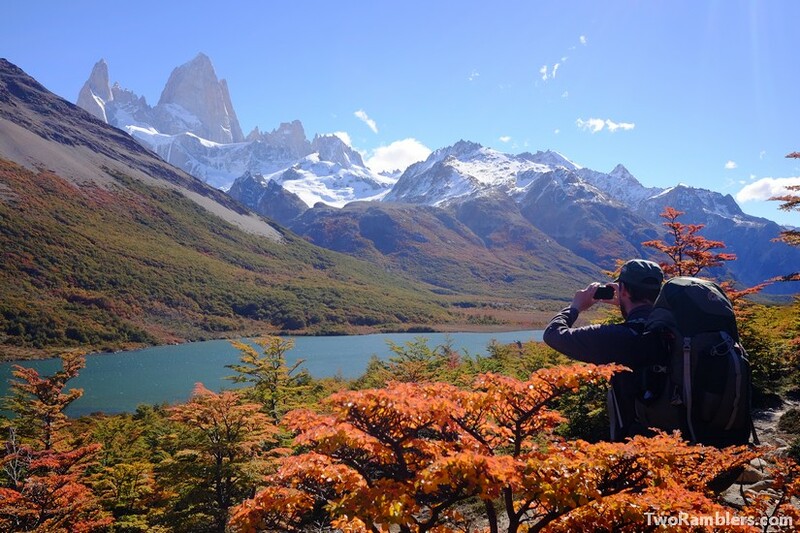 It ended up being one of our favourite treks in Patagonia, with stunning views over Mount Fitz Roy and the beautiful autumn colours all around us. From El Calafate we had gotten a ride from an Australian couple and their friend from the US. 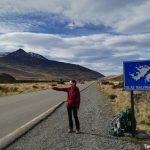 They had just arrived to the south of Argentina and were incredibly enthusiastic about the landscapes we drove through. Every guanaco, every mountain, every lake good a ‘wow’ and was worth a photo stop. Not that we needed a reminder but again we became aware of the beautiful surroundings we were in. 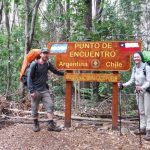 Initially, we had thought to spend a day in El Chalten before setting off on a four day hike. However, the weather was so good – for once almost no wind and loads of sun – that we decided to leave immediately. With some delicious empanadas and bread from a local bakery in our stomach we were ready to go. 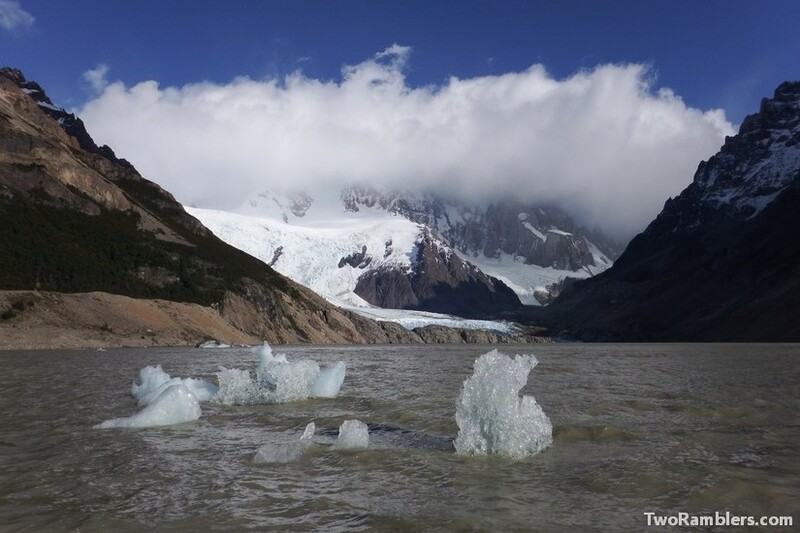 It was already afternoon when we left El Chalten towards Glacier Torres. The hike went mostly uphill through forest for a bit more than two hours. Many people were coming the other way, going back to El Chalten after a day hike to the glacier. 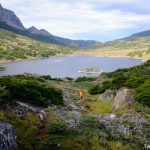 We knew that the hike was not going to be as solitary as the treks on Isla Navarino or to Cabo Froward but it was comparably calmer and cheaper than Torres del Paine. The access to the trek is free and so are the campsites. After crossing a bridge and filtering some water, we reached the campsite. There were about 15 tents, spread out between trees protecting us from the wind. As we packed up our things on the second day, Franziska noticed some small pieces of paper all over her backpack. At a closer look she realised that they came from the small bottle of hand sanitizer that she had left outside her pack. It turned out that a mouse had been busy with the bottle over night. It had bitten its way through the bottle and must have gotten drunk on the high percentage liquid. Even the pieces of plastic on our backpacks were nibbled on. At least we had properly packed our food out of reach. From the campsite we walked up to a lookout which offered a good view over Glacier and Laguna Torre. Blocks of ice had fallen from the glacier and floated to the coast we were standing on. They were shining in the sun. 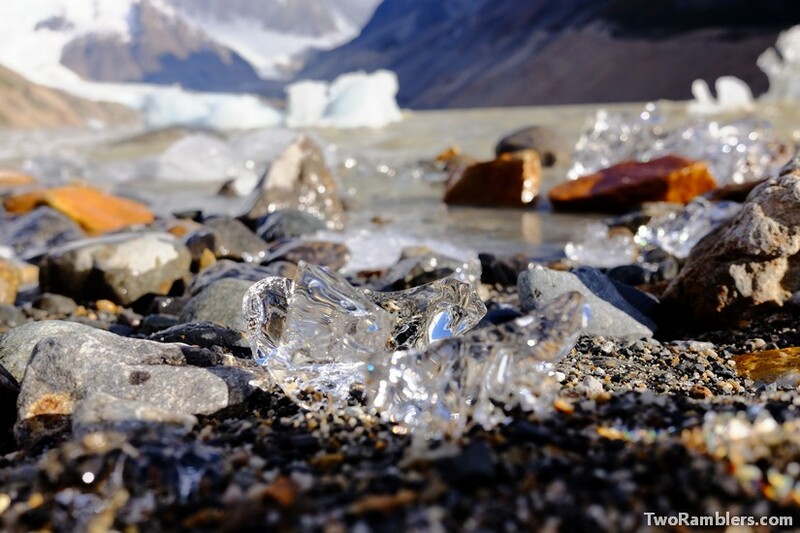 Some pieces of ice were milky, others transparent like glass, some were deep blue. For a while we just stood there amazed by the different colours and shapes of ice. We continued our hike towards the campsite Poincenot, first following the path from the day before along Rio Fitz Roy. At one point quite a few hikers stood around taking pictures. As we got closer, we saw what they were looking at: two deer grazing on the other bank of the river. They did not seem to worry about the small crowd of people climbing over the rocks in the river to get closer to them. 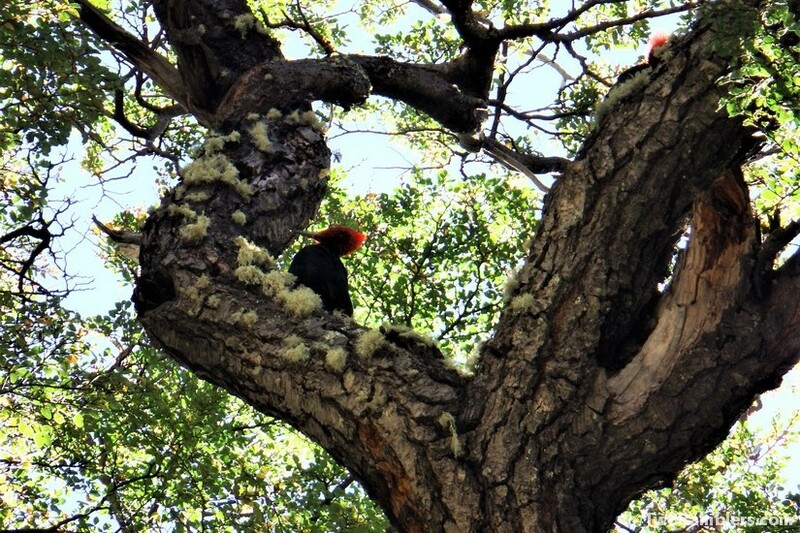 Just like the many birds we had seen on our hikes in Patagonia, the animals were in no way as afraid of humans as animals tend to be in European forests. The route lead us along two beautiful lagoons Hija and Madre. Around them trees were in full autumn colours, bright red and yellow. Behind the lagoons Mount Fitz Roy with its rugged shape slowly came into sight. In the early afternoon we reached the campsite Poincenot. It had many well constructed walls of wood built by campers to protect their tents from the heavy winds. We put up our tent behind one of these walls and spent the afternoon reading in the sun. Carefully we stored all our belongings away to avoid another mice attack and then went to sleep. The next morning, we got up while it was still dark outside. 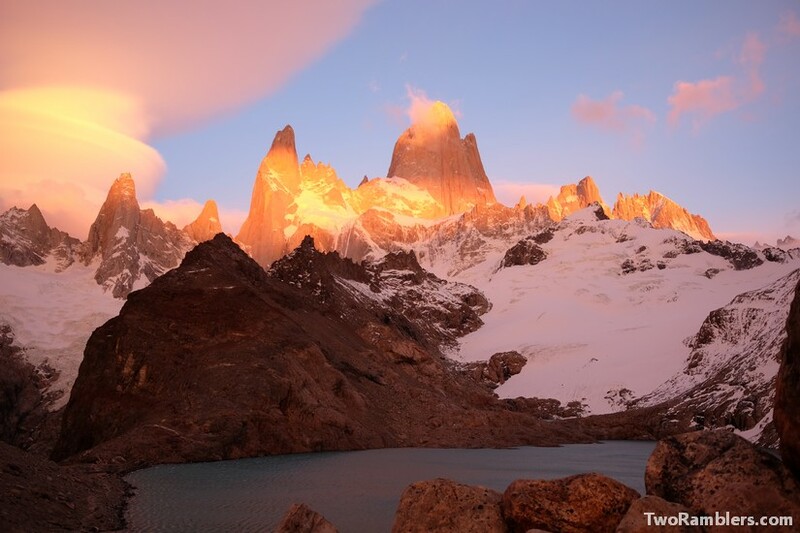 Only with the light of our head lamps we walked to the view point over Mount Fitz Roy. It took us almost an hour and a half of walking uphill. Luckily the route was clear but with some strong winds it was a challenge to climb up the steep track. Almost half way up the hill we saw the first thin line of red light appearing above the hills behind us. We reached the view point perfectly on time. The sun was coming up from the mountains opposite Fitz Roy. 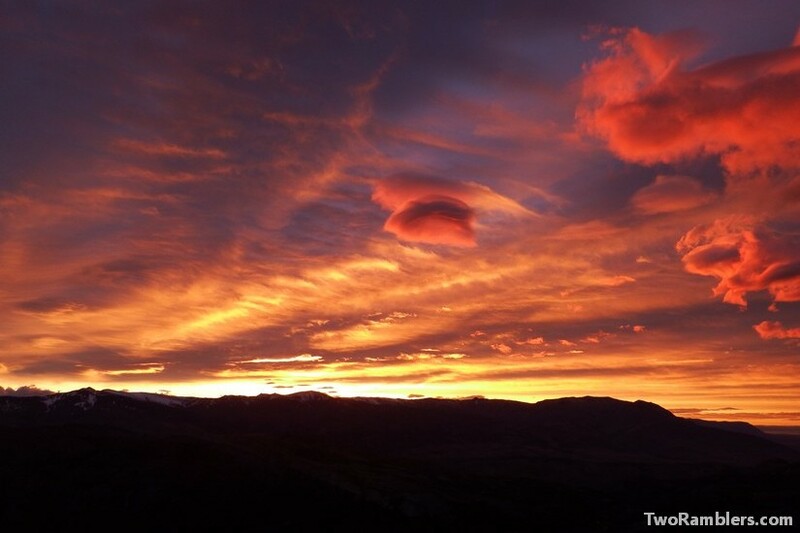 First, the sky and the mountains took a slight purple colour, then they turned red and finally bright orange. Clouds in the weirdest shapes were sitting above the mountain tops. Especially around Fitz Roy there was always a small shred of cloud, stuck to the peak as if it was sheep wool stuck to a fence. 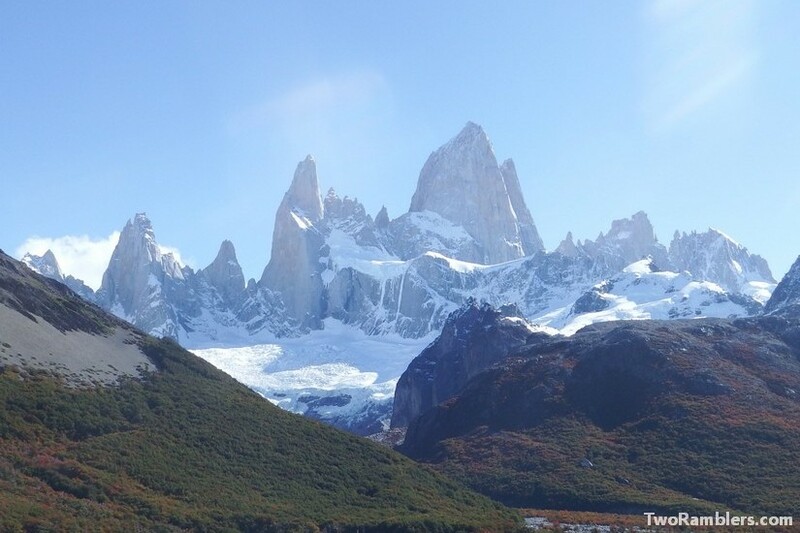 In the Tehuelche language (spoken by the indigenous people of this part of Patagonia) Mount Fitz Roy is called Chalten – the smoky mountain. This is because of the clouds hanging around its peak. We watched the spectacle of the sunrise from behind some big rocks, trying to hide from the strong, icy winds. While we were up on the view point the wind got stronger and stronger. So we hid behind the rocks only to peak out now and again to see how the colours were changing. The walk back down was more difficult than coming up. Although we could now see much more around us, the wind had become very strong and wild. On the steeper parts we were desperately looking for rocks or vegetation to hold on to, so that we would not be blown off the mountain. 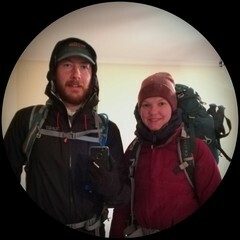 After some well deserved breakfast at our tent, we left for another walk. 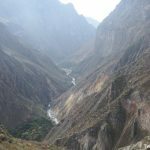 We had planned a four hour round walk along Rio Blanco. We had found this route in a guidebook we had borrowed from some other travellers back on the ferry from Isla Navarino. However, there was no mention of the path on any of the maps in the National Park. We managed to find the trail along the river, it was less maintained than the other routes but we decided to give it a try. For about an hour we walked along the river. The wind had not calmed down since the morning and actually became even stronger as we walked. It blew over the river, whirling the water into the air. At one point, it got so strong that it managed to lift up Kevin just a little bit off the ground. We reached a view point on the Fitz Roy Glacier from which a river was running down that we had to cross. Kevin was determined to find a way across over some rocks in the wildly running water, but exhausted from pushing against the wind and worried about getting blown right into the water Franziska convinced him to return to the campsite. Back at the campsite we saw that we had made a good decision. Big rain clouds were coming closer. We decided to spend another night at the same campsite rather than risking to get soaked on the way to the next campsite. We spent the afternoon protected from the heavy rains and wind in our tent. Over dinner inside the tent we could hear other hikers arrive, already soaked, still having to put up their tents in the rain. It was a very cold night. The trees around the campsite had provided some protection but as we walked to the river to get some water we saw that the ground was frozen and there were icy puddles all around. 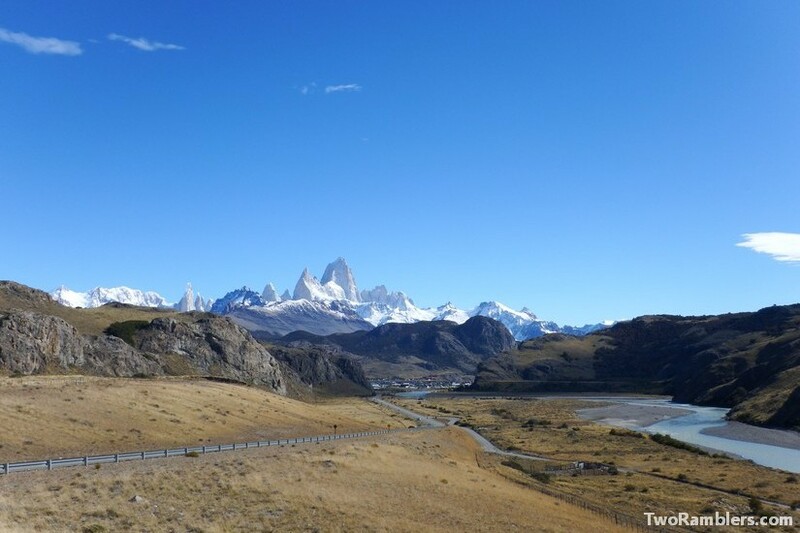 It took us a moment to warm up on the way back to El Chalten but it turned out to be a very sunny day. Loads of day tourists were walking into the National Park. Now it seemed just as busy as a shopping street on a weekend. For several 100 times we said “hola” to hikers crossing our way. 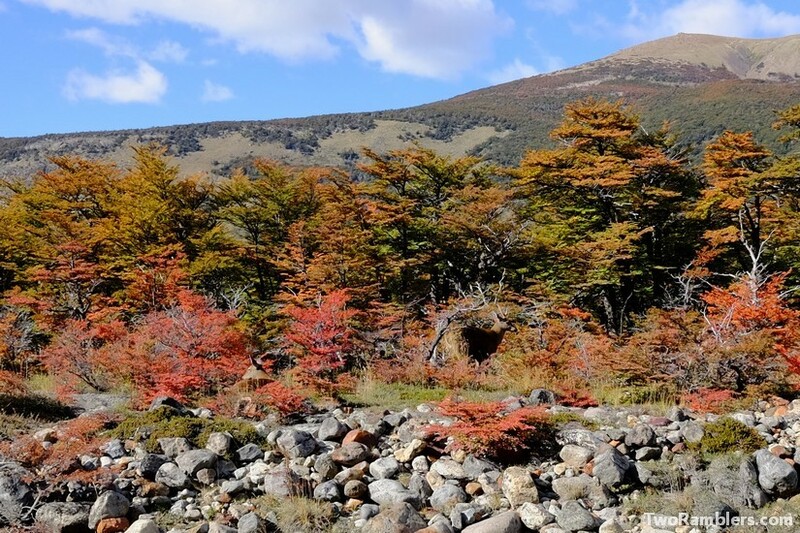 We were almost in El Chalten when we passed under a big tree from which came some heave knocking. At a closer look we discovered three very busy woodpeckers hammering away at the tree. What a sight! Again the birds did not seem to be concerned at all by their audience. With all the wildlife we got to see and the colourful spectacle of autumn and the sunrise, we will remember this hike as one of our favourites. 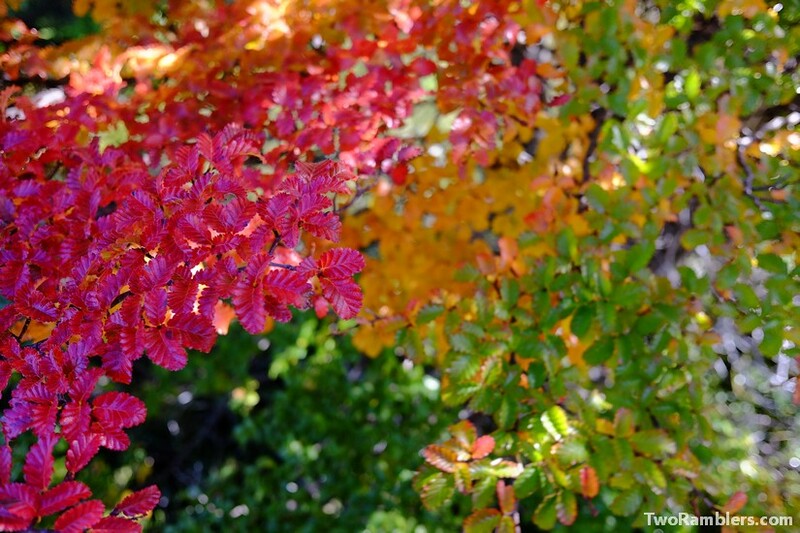 Danke an euch für die wieder zauberhaften und farbenfrohen Bilder und Beschreibungen. Ich wünsche euch einen erholsamen Ausklang eurer spannenden Reise und freue mich mit euch, dass alles so erfolgreich verlaufen ist. Also ich habe was ganz anderes geschrieben! Der zweite Satz ist garnicht von mir, dafür fehlen meine Worte! Am liebsten deshalb bis bald und dann persönlich. Habt eine gute Zeit und ich freue mich für euch, dass eure Reise so erfolgreich war und ist! Wie schön zu hören, dass Dir die Bilder gefallen. Danke für Deine lieben Worte! Ja, wir sehen uns bald in Berlin.